John Robertson revealed a photograph of Inverness’ William Hill Scottish Cup-winning manager John Hughes is driving him on to bring the trophy back to the Highlands. Hughes ensured his place in the club’s folklore when his Caley Thistle side won the cup for the first time in 2015 with a 2-1 win over Falkirk at Hampden. 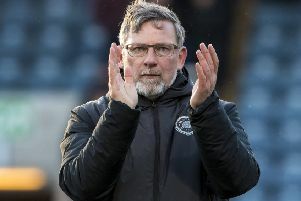 Hearts legend Robertson made two semi-finals in his first spell as Inverness manager and is looking to go one better when he takes on the Jambos in Saturday’s last-four game at Hampden Park. Robertson, who managed Hearts as well as being the club’s record league goalscorer, admitted that Hughes’ beaming face in a photo at the Caledonian stadium is an inspiration. He said: “We have photographs downstairs and I see John Hughes’ beautiful smiling face every day with the Scottish Cup and I think, ‘I’d like a bit of that’. “We are a Championship club, we are not supposed to get to the last four, we are not supposed to get to finals and we desperately want to get there. I have been manager of Inverness for four full seasons and we have reached three Scottish Cup semi-finals which is tremendous. The players have been brilliant. “I also reached a Scottish Cup semi-final with Hearts. “We have not got to a cup final yet –I’d like to get to a final and would like to win it. Robertson, 54, insists he is an old romantic when it comes to football. He said: “It annoys me when you see teams in England resting players for the FA Cup and not playing a full-strength team. “When I grew up, Roy of the Rovers was the magazine you read on a Saturday morning, and you read Shoot magazine, and the biggest thing of the season was the last day, Scottish Cup day, FA Cup day, being involved in the showpiece game and winning the trophy. “I know things have changed, money has changed a lot of things; the Champions League. But for me, there is something magical about being involved in the cup final and Saturday brings an opportunity to try to reach it. “It is going to be tough, really tough. “We are a Championship team against a Premiership team who are a good side, with lots of good players who have already beaten us this season (in the Betfred Cup).